Wear your MHC pride not on your sleeve, but right on your skin! 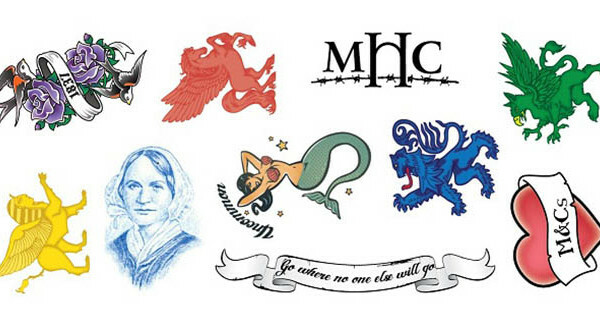 Each 4″ x 9″ sheet contains ten Mount Holyoke-themed tattoo designs to satisfy alumnae of all ages. Tattoos apply easily with water and last five to seven days. Perfect for reunions, mini-reunions, club events, and any time you want to feel close to old MHC. Have a job interview coming up and need a little confidence boost? There’s a tat for that. Meeting up with your old sophomore roommate who always thought you were a little too straight-laced? There’s a tat for that. Having lunch with Lynn Pasquerella? There are many tats for that. Each sheet fits into a standard business envelope, so buy a few and mail them to your far-flung alum friends (or leave specific instructions when you order, and the Class of 1995 will do it for you). $10 for one sheet and $15 for two. Order using PayPal at www.mhc1995.com or send a check made out to “Mount Holyoke College Class of 1995” to Rebecca Gold at 1 Barrington Pl., Great Barrington, MA 01230. Contact Rebecca at rebecca.gold@alumnae.mtholyoke.edu for discount rates on bulk orders. This onesie is perfect for any future alum or their brother! 100% cotton onesie made by Gerber comes in sizes 6 and 12mos. The front reads “Got milk (& cookies)?” and on the bum is mhc. Cute, comfy, and necessary in every baby’s wardrobe. $12.00 shipping included. Pay by check made out to “Mt. Holyoke College Class of 1995” and send it to Michelle Chuk (include size and qty). You can also pay by credit card through PayPal. Visit www.mhc1995.com/shopping.htm for order forms.